Located on the left side of the screen, this panel is used to manage items for your media tour. Located at the top of the middle section, this panel is used to add pictures, characters, videos, and Flash movies. Located at the bottom of the middle section, this panel is used to add a caption to each item in the tour. Go to the Media Tour tab on the ribbon and click Add Item. Drag them to a new location in the list. An orange line will move with your mouse to indicate where the items will be dropped when your mouse button is released. Go to the Media Tour tab on the ribbon, click Move Item, then select Up or Down. Go to the Media Tour tab on the ribbon and click Delete Item. You can add one image, character, video, or Flash movie to each step in a media tour interaction. Just click one of the icons in the media panel. To switch to an item of a different type, click the red X below the item in the media panel to remove it, then choose a different media type. Mark this box to add player controls, letting learners play, pause, and scrub back and forth. If you include a playbar, you'll also have the option to automatically start the media or wait for learners to start it when they're ready. To learn more about adding media in Engage, see this user guide. To add audio to an item in your interaction, see this user guide. Unlike other interaction types, the steps in a media tour interaction don't have titles or alternate text fields, but you can add a caption to each step. 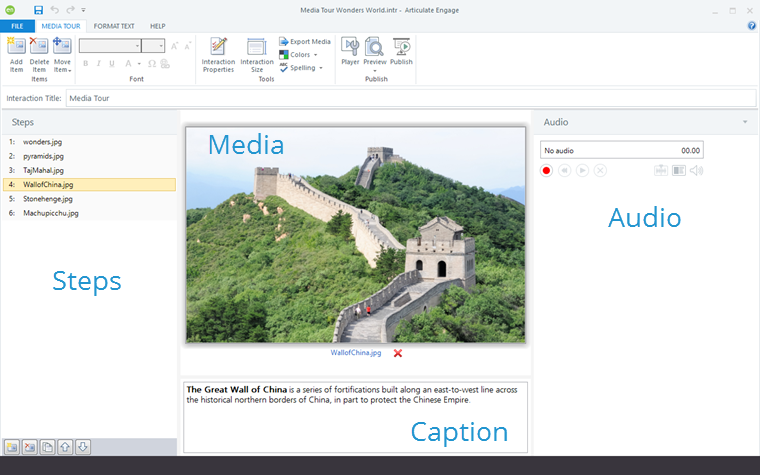 Captions function as titles, and they're also read by screen readers for visually impaired learners. Just enter the descriptive text in the caption panel and format it using the text formatting options. Go to the Media Tour tab on the ribbon and click Interaction Properties. Select the Media Tour tab on the left side of the window that appears. Mark Show Captions to display captions in your published interaction. Uncheck the box to hide them. Select the Colors and Effects tab on the left side of the window that appears. To change the colors used for the light and dark color schemes, see this user guide. Go to the Media Tour tab on the ribbon and click Export Media.